Fred B. Monroe « James McElroy & Diehl, P.A. Fred focuses his civil litigation practice on representing individuals and companies involved in complex business disputes. Fred’s trial experience, when coupled with his educational background in the areas of finance and accounting, provide him with a distinctive ability to counsel clients on business litigation issues. Fred is uniquely qualified to assist individuals and businesses involved in complex disputes in areas such as: derivative actions, dissolutions, waste of assets, minority shareholder rights, controlling shareholder obligations, dissenting shareholder rights, officers’ and directors’ liability, executive compensation, restrictive covenants, trade secrets, employee stock ownership plans, business valuation issues, financial products, estates and trusts and severe bodily injury. In addition, Fred has represented investors in arbitrations before the Financial Industry Regulatory Authority (FINRA) and has given continuing legal education lectures to other lawyers in that practice area. Fred is a member of the Public Investor Bar Arbitration Association (“PIABA”). He also represents licensed brokers who are either embroiled in employment disputes in which they were denied compensation or were the victims of false accusations. Fred’s clients have ranged from large institutions, such as a public university, to businesses and individuals. Fred is also a certified mediator. The North Carolina Business Court for Complex Cases has appointed Fred to serve as a mediator and has found him qualified to serve in the capacity as a receiver in complex business cases. As a first chair lawyer, Fred has successfully prosecuted and defended many cases in trials before judges, juries, and arbitration panels. 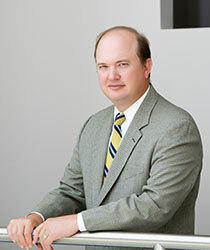 Fred has practiced law in Charlotte since 1997. He hails from the eastern part of North Carolina with roots in the Moore and Montgomery County area. He attended the University of North Carolina at Chapel Hill, graduating in 1991 as an English major. He subsequently attended Mercer Law School, graduating in 1996, where he was a member of the Mercer Law Review. He then clerked with the North Carolina Court of Appeals for the Honorable Gerald Arnold, Chief Judge. In 2013 Fred obtained an M.B.A., Finance, from the Kenan-Flagler School of Business at the University of North Carolina at Chapel Hill. Fred is active in the Charlotte community. He served a six-year term as an appointed member of the Storm Water Advisory Committee for the City of Charlotte and Mecklenburg County. Fred is happily married and has two young children. When he has spare time, he enjoys almost all outdoor sports including fishing, hunting, and boating. Mecklenburg County Bar News, June, 2010, Spotlight. Noted for pro bono contributions in the field of estate litigation. For more than a decade, Alex Heroy has focused his practice on civil litigation of all types, specifically complex personal injury, non-traditional medical malpractice, and business disputes. With more than $25 million in settlements and jury verdicts for his clients, Alex has often defeated big-name corporations and other influential defendants.